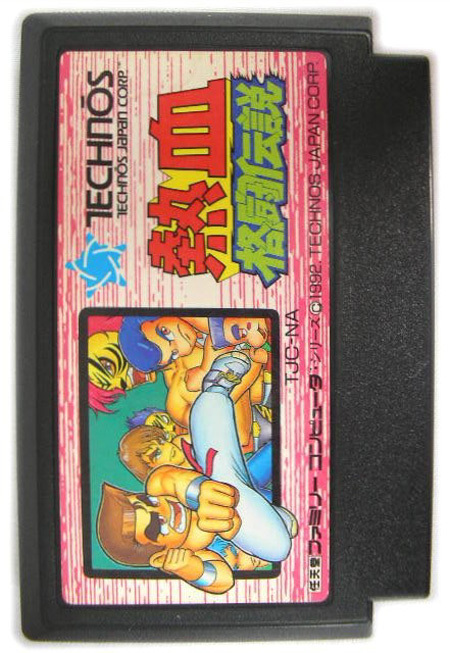 Nekketsu Kakutō Densetsu (熱血格闘伝説, Nekketsu Fighting Legend) is a tournament-style fighting game from the popular Kunio-Kun series (the most famous US release from which was "River City Ransom"). Depending on the date of birth you enter, your character will be given one of 20 move-sets. Special moves are performed either by pushing A or B while at the apex of a jump or just after a landing, depending on which moves you have at your disposal. Also, according to the compatibility of astrological signs between you and your fighting partner, your team will be more or less powerful (red uniforms are the most powerful team, while yellow uniforms are the least so). The object of the game is simple; beat the crap out of the other team before they beat the crap out of you. The last team standing at the end of the tournament wins!